Ann Richards had a lot to do with my political formation back in the late 1980s and early 1990s. She was the candidate for Governor of Texas while I was living in Dallas and attending college. I was a young Republican from New York when I arrived at SMU and remained so until I started to realize that there were elements of the GOP's extreme wing that made me totally uncomfortable. As I was undergoing that "awakening" process, Ann Richards was there to be the face of the Democratic Party. Sunny, funny, and wicked smart, she was candid in the challenges she faced in life and unwilling to be boxed in by good-old boy exclusions. 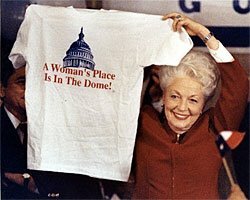 Ann Richards was a force to be reckoned with. As Governor she kicked down a lot of doors in Texas politics, and showed lots of young people (myself included) that there was honor, dignity, and yes, potentially a lot of fun, in being involved with politics and government service. Link above and picture from the Dallas Morning News. From the USA Today: "A longtime champion of women and minorities in government who was serving at the time as Texas state treasurer, she won cheers when she reminded delegates that Ginger Rogers did everything Fred Astaire did, "only backwards and in high heels." This is a sad article to read. I have always respected Tony Blair for his ability to shift the Labor party to the center and create a strong and lasting governing coalition in Britain. Nearly 11 years is a long time in power, to be sure. But when you read in depth the analyses of the last few years of Blair's tenure (in British online papers of all political stripes), it's clear that his close association with President George W. Bush has been a major drag on his popularity, his effectiveness, and his ability to get things done. Looks like he'll be gone sometime mid-next year, though my gut tells me that once he's exposed his "belly", so to speak, the inevitable departure could ultimately take place much sooner than that. "Archie's Kids" have definitely proven they were worth the hype now that they've hit the big time. Sunday night will make for great viewing for sports fans. 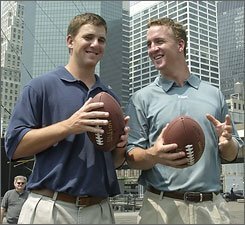 NEW YORK — "When Eli Manning got beat up as a child by his older brother, it wasn't in the traditional manner. Instead of fists, Peyton Manning bruised his kid brother with bullet-like football passes. 'He was being a team player,' Peyton says of the one-sided games of catch on their front lawn in New Orleans' stately Garden District. 'He was helping his older brother get ready for his senior year of high school football.'" Get the rest of the story here.